Housing starts in the US dropped 5.3 percent from a month earlier to an annualized rate of 1,201 thousand in September of 2018, following a 7.1 percent gain in August and compared with market expectations of a 4.5 percent fall. Starts in the South declined the most since October 2015 mainly due to Hurricane Florence, which hit North and South Carolina in September. Housing Starts in the United States averaged 1432.71 Thousand units from 1959 until 2018, reaching an all time high of 2494 Thousand units in January of 1972 and a record low of 478 Thousand units in April of 2009. NAR hasn’t released its September housing stats however in their August report, they found that sales were up in August after 4 months of decline. According to NAR, house prices nationally rose about $5500 to $253,100. In California and the rest of the west, prices rose $1600 to $374,900. NAR believes home prices will rise 9% YoY in 2019. 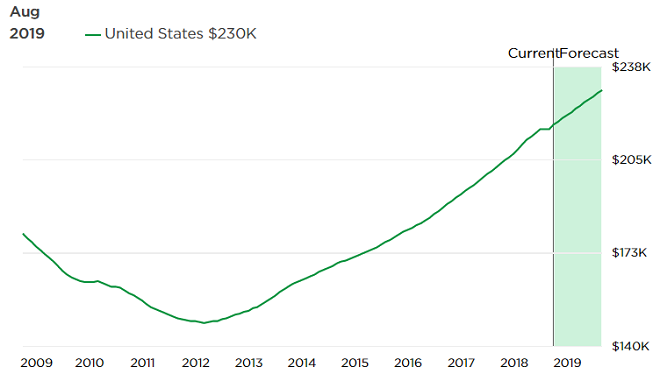 Zillow reports the average home price in September 2018 was $218,000. They forecast a rise in price of 6.4% over the next 12 months. Homes in Washington and Colorado are the most expensive on average at above $333k. Average rental prices have leveled off at $1,442 per month nationally.